I’ve planned to write up a blog post up new cool Nebula-Features since some time but failed because of time constraints (e4 has been my main focus). Any ways there’s not only cool stuff happening at e4. So this blog post is dedicated to new widgets and new features that got integrated in the Nebula-Sources. 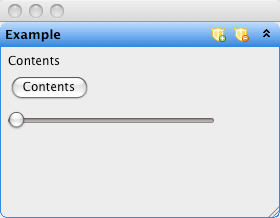 Did you every wanted to display icons in your ComboViewer or multiple Columns? CCombo is not able to do this because it uses a SWT-List-Widget. Nebula comes to rescue in a way that it provides you the a CCombo variant which uses a Table-Control. 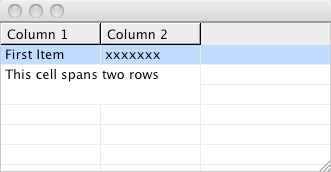 One of the coolest things we introduce into Grid is the possibility to span not only columns but also rows like you know it from other grid-controls. Beside that we fixed some bugs. I think the important thing when saying we is that all those things have been coming from the community! Thank you very much! In PGroup I’ve integrated myself the feature of adding ToolItems into the Header section. The API provided is very similar to the one you know from ToolItem so you are able to create items of type SWT.PUSH, SWT.CHECK, SWT.RADIO and SWT.CASCADE. I’d like to thank Ubiquiti Networks, Inc. sponsoring the work and contributing it back to Nebula. I know that this is a really pressing issue and holding of many people from useing Nebula. As stated often before many of the controls have stable API and are more or less bug free (at least there are no major problems known for them) but there are also widgets lurking around, waiting for maintainers and are not in a consumeable state. It’s impossible for me as a project lead to step up at all the fronts and taking over the maintance (I already did this for PShelf, PGroup and Grid). All those duties keep me away from doing the project management where the most pressing issue is to restructure Nebula into 2 projects: One for incubating widgets and one for stable widgets ready for a 1.0 release. Please keep that in mind when you come to Nebula. We are not backed by any commercial vendor beside the rare occurences where companies fund a work on a feature nobody is paying us to do the maintance, … . I state this here because especially in the Eclipse Universe people are not so used to deal with projects not backed by at least one company. Great work Tom! Thanks for making things a bit transparent on what is going on with the Nebula project. The former ran 13 days ago but does not build CDateTime. The latter does include CDateTime but was last run 4 months ago. No recent release, no roadmap, not even a recent build. Has CDateTime been abandoned? Can I get the TableCombo jar (even though it is in alpha state) . I cannot get it from the Nebula becos the build is broken. I am trying for this for past one week. We have a tycho build running on hudson which creates a p2 repo the problem is that I’ve not been able yet to make the build sign it and publish to download.eclipse.org. I don’t want to post the url to the public so if you are in desperate need of a build tablecombo send me a private mail and I’ll give you the url. The other option is to check out the sources from our CVS-Repository!